Celebrate Crafts: The Everything's ABC's blog hop letter "E"
If you came from " Lucy ~ Love 2 Create" then you're on the right track! For my "E" I chose Embossing. I cut my card base out of slate card stock, 41/4 x 5 1/2. I think inked the edges with the pigment ink Indian corn blue using a sponge dauber. I cut the hexagon from white daisy card stock at 1.2 inches, using the cricut cartridge Accent Essentials. I stamped the hexagons using the Honeycomb stamp set, using the mini pigment inks. While the ink was still wet, I sprinkled the hexagons with startdust transparent embossing powder, which when heated left my hexagons sparkley. The sentiment was stamped using the Indian corn blue, and the sentiment is from the Fabulous you stamp set. I then placed bitty sparkles all over to give the card more sparkle. 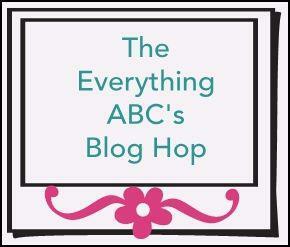 Your next stop on our Everything ABC'S blog Hop is "Shelly " of "Just One Piece"
Cute! Great idea to emboss the hexagons. TFS! Love this stamp set, thanks for sharing! Love the simplicity of your card yet elgant.